I knew that having made the clock mount and its accompanying surround I should really have got on with some kind of front screen, but I didn’t. I decided to make a chain guard instead. In a funny kind of way I found myself in the situation where I’d tried to plan everything out as much as possible, in a loosely efficient project management kind of way, and then found myself deliberately jumping from one part of the plan to another rather randomly. I’d call it something like organic execution. Having planned everything out systematically, I was free to approach the list of tasks depending on how I felt on the day. That day I was much more in the mood to make a chain guard than to start to get to grips with the next big thing which was the rear mudguard or fender. At least with this next part I followed very closely one of my guiding principles of the build which was to lose weight. The standard part, as any GN owner will tell you, is a substantial piece of kit. Whilst I understand fully the need to prevent ingress of foreign objects into the chain run, I can’t for the life of me see why said part has to be the depth of a piece of industrial guttering and sturdy enough to shake off an attack of rocket propelled grenades. Whatever, it weighs a ton and made its way swiftly into the ever growing pile of discarded ironwork growing in the corner. It would have been much easier I know, to have followed the weight saving creed to its maximum and not fitted anything at all but I wanted something there to stop things like loose rucksack straps getting too close and prevent the back of the bike and ultimately me, getting a good spattering of flung off chain lube. A quick trip to the DIY store and I’d got myself a very handy length of aluminium ‘L’ section, the angle to give it some rigidity, and a length of flat bar as well for making a couple of brackets. 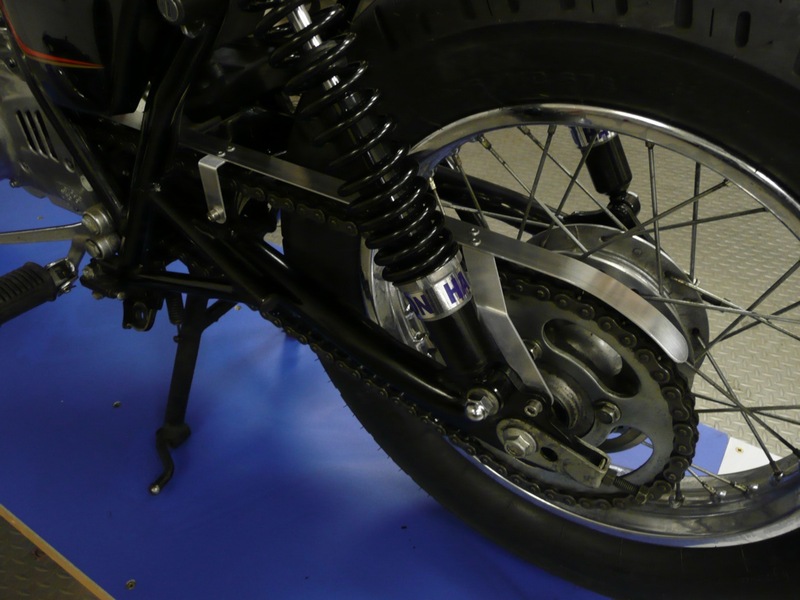 By trimming off part of the angle, to create a flat section, it was easy enough to bend the strip around a quick wooden former to get a radius that would sit nicely above the rear sprocket. 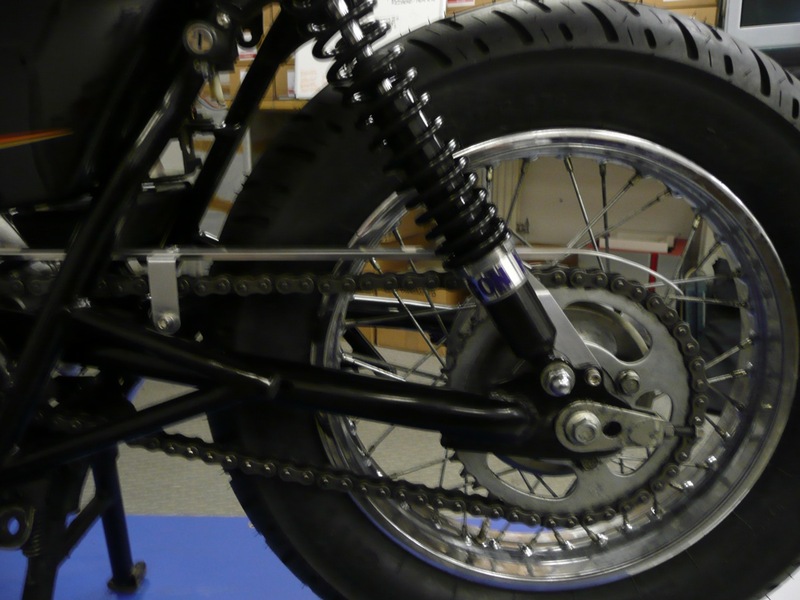 I could then trim the length of the whole thing at the end that goes over the front sprocket. Duly done it was just a question of working out how high off the upper chain run I wanted it to sit. As the chain can flap whilst your traveling, too low and each journey would be a rattling affair. To tell the truth I did get it a bit low to start with and modified it very quickly soon after the first test ride. For the rear of the guard I made the bracket at an angle to match the rake of the rear shocks, to kind of blend in, and secured it to a conveniently located hole above the chain adjuster on that side. The front bracket was a simple piece with a single 90 degree bend in it, and I cut it to a length which would allow me to raise or lower the guard at that point should I need to, which I did as you’ve already read. I attached the brackets to the guard using some ‘Pop’ rivets, another godsend to the home builder, and it was complete and ready for a coat of trusty old black paint. Job done. Now I knew I couldn’t put off the rear fender any longer.